Here we are on week #3 in the Fab Friday Stamping Challenge universe!! Today's challenge is this awesome sketch!! I really had fun with it (even though I felt like my mojo had taken a holiday today!). I love working from a sketch ... seems to make the creative process MUCH easier!! Update on my mom - she did a LOT of sleeping yesterday, but she seemed to be rallying a bit in the evening. We are hoping she will be home in her own bed within a couple of days. Thanks for all the kind words!! How fitting that the two layouts I am sharing today have something in common ... they BOTH feature my babies ... this first one is of my youngest "baby" on her graduation day this past June. Where in the WORLD did the time go??? I honestly have NO idea!!! 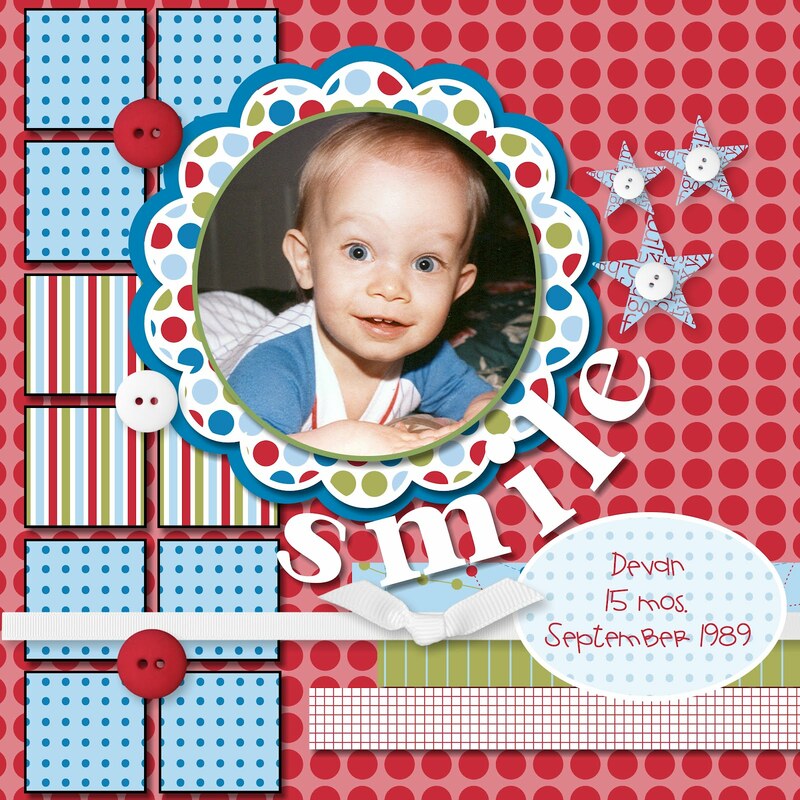 It seems those years are oh-so fleeting (sometimes I really wish I could have a "do-over!" I truly enjoyed my kids as they were growing up). 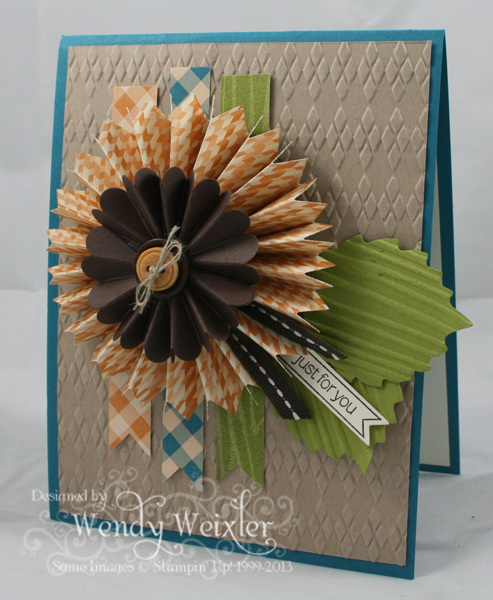 Embellishments: Kraft Button, Designer Brads - Star2, Kraft Grosgrain Ribbon; Font - Casmira. 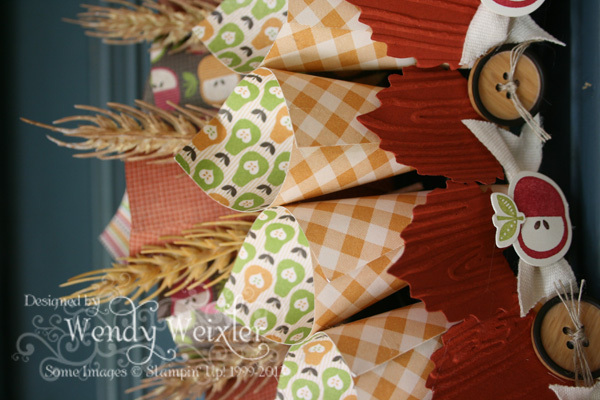 Other: Scallop Circle Punch, Lauren's Letters Alphabet, Large Oval Punch, Round Buttons, Whisper White Grosgrain Ribbon; Font - CK Buddies. It is now 12:35 a.m. and I have been sitting in the ER with my mom since a little before 8:00 p.m. ... we are just waiting-waiting-waiting for them to come and get her and take her up to her room (they ARE admitting her, but with a bit of medicine and a couple of days of observation she should be feeling MUCH better!!). Why does EVERYthing that goes on in a hospital take so stinkin' LONG??? At least it gave me time to type up a blog post!! I have been known, on occasion, to be coerced into making wedding announcements for people I know ... doesn't happen all the time, but I do at least one or two sets a year. Looks like it's that time again. I always find it fun and interesting to see what the bride helps me come up with. I never take on these adventures alone. For such an important day, I want it to be what makes the bride happy, so it is usually a team effort. This one makes me smile ... not for the reason you would necessarily think, though. It actually makes me think of proms in the 80's ... the color combo isn't too far off of what me and my date wore to my Junior Prom (HE wore a burgundy tux ... NO LIE!!). 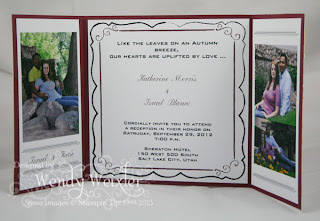 And since the bride had chosen burgundy and "peach" as her color combo, I was VERY lucky that I had a leftover stash of Apricot Appeal in my "retired" file box. And I mean VERY lucky! I cut up every last scrap I had in order to get these done!! Here's a peek at the inside that I created using MDS. That program has come in sooo stinkin' handy! I am amazed at how many different projects I have used it for! 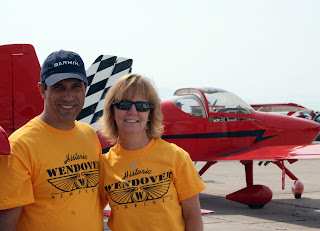 My husband and I spent part of the weekend in Wendover volunteering for the airshow they had there. It was great fun ... we have made so many awesome friends in conjunction with our love of flying. So fantastic to have so many great people to share it with. 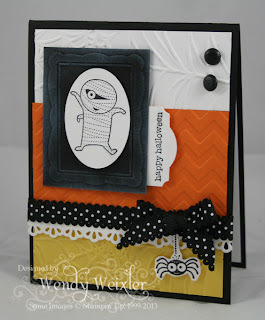 Welcome to this month's Control Freaks Blog Tour, where we are celebrating HALLOWEEN and FALL!! This month was SOOO much fun for me, as y'all know it is my mostest FAVORITE time of year!! If you have been hopping around the Tour, you have just come from the ever-amazing Eileen LeFevre!! More wonderful goodness going on there, I tell ya!! I am so-so-so-so-so EXCITED to share this first project with ya. This one just literally fell out of my fingertips this afternoon (I know, I know ... it would be MUCH easier and MUI-better if I didn't wait until 3:30 p.m. on the afternoon of the Freak Tour to start, right??? Lucky for me, there were already ideas swimming around in my head with all the other junk I store up there!!)! 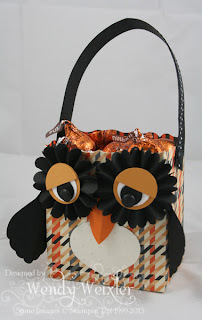 Isn't my little owl stinkin' FUN???? I knew I wanted to make something "owlish" when I started, but it didn't really start rolling until I pulled out the Fancy Favor Bigz Die ... then it just kinda happened!! And (of course) he is filled with my new favorite fall treat ... Pumpkin Spice Kisses!!! YUMYUMYUM!! Next, I got a little spooky (again!) 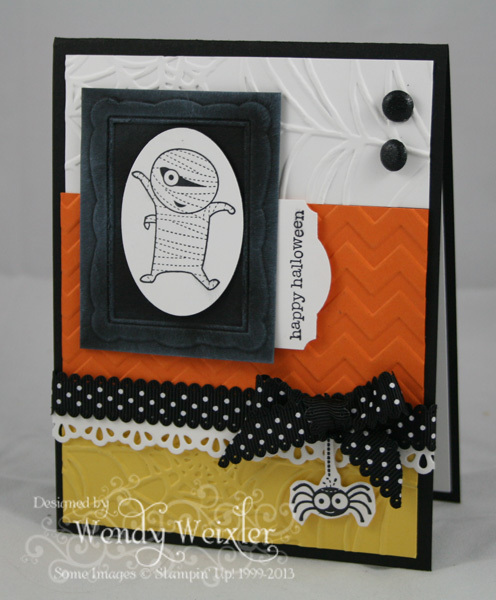 with this cute little mummy dude from Googly Ghouls. I am SAD that I FORGOT to order the googlie eyes to go with this set ... it's gotta be on my next order for sure!! I had the idea for the "candy corn" background in my head all day, so I was glad to get it outta there (since there is already so much stuff shaking around in there!!). And last of all, I decided it was time to go a little simple ... I haven't done the "sponge-one-layer" stamp thing for a long while. Somehow, leaves in the fall always make me wanna do this!! 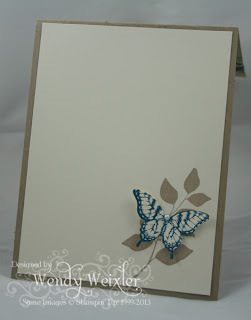 I love leafy images ... very simple, yet very elegant. Next up? You can move on over to the blog of my BFF, JanTink!! She let me peek at her creations this morning before she took photos ... they are AWESOME!! They come around every week ... whether you want them to or not!! Some weeks even seem to have MORE than one Monday (which I HATE!). Poor Monday ... it gets such a bad wrap! 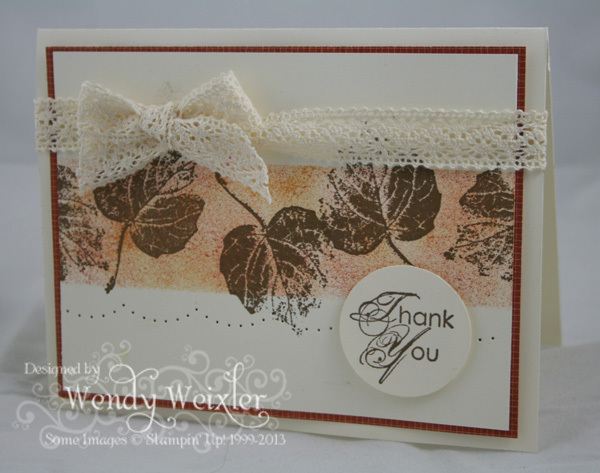 I made this card with my stamp club girls a few weeks ago ... been so busy posting other stuffs that I haven't had a chance to get to this. I REALLY like the color combo on this ... would NEVER have thought to put Pool Party with Daffodil Delight and Early Espresso, but that's why Pinterest is SOOO stinkin' awesome!! On a totally unrelated note ... I've had to do some re-evaluating this past couple of weeks. Sorting through what is really important in my life and what is not (not really that hard!). You see, our house was broken into at the end of August. They were probably only in our house for a couple of minutes ... but it was long enough to take some treasured items. Luckily, they left WAY more than they took; they didn't hurt my doggie; they didn't destroy my house; and I didn't come home in the middle of it (which would have been VERY scary!!). And although some of the "things" that were taken were of great sentimental value, I have come to the conclusion (as I have MANY times in my life), that I am truly blessed and have so many things to be grateful for. In reality, none of us gets to take any of our treasured things with us when we go ... but the relationships we build, the memories we have created and the love we have given/received all get to come along. So, for that I am truly grateful! Here we are again ... back for another Fab Friday Challenge!! This time around, we are working with color (I LOVE color challenges!!). And today's colors are SUPER nice!! 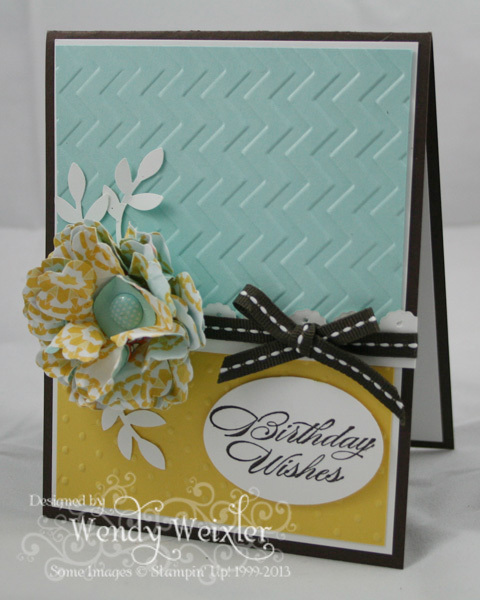 Basic Gray, So Saffron and Sahara Sand (and I realized AFTER I had made my card that I totally muffed this ... FORGOT to add the Sahara Sand to it ... AND I somehow thought Basic Black was in there somewhere!! Where did my BRAIN go???). This has NOT been my week! 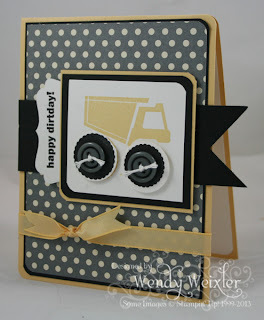 Cards for dudes are always a challenge for me anyway ... and little dudes are no different! Just barely got this set, so I decided to put it to use!! Here is a link to the Fab Friday Challenge Blog, so be sure to check it out!! SOOO happy it's FRIDAY!!! Enjoy your weekend, friends! Today has NOT gone as planned!! 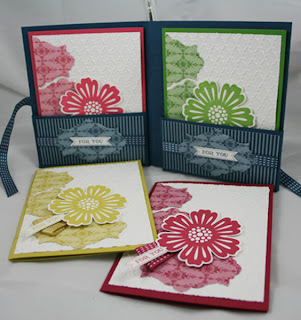 I have been trying to post these projects all dang day!! Problem is, we were having some inspectors coming to look at the house, which meant I had to do an overhaul (aka cleaning up!)! And to top that off, I my phone has been ringing off the hook AND I've had several unplanned visits to go put out fires ... so I am just now getting to it!! Sheesh!! 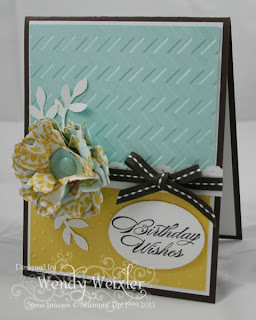 And this is a happy birthday ... same basic card, with a little bit of difference. 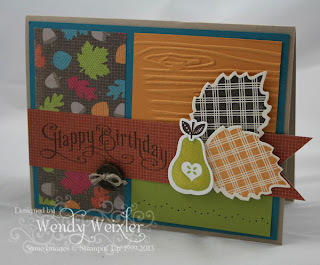 Was inspired to make this card from the ever-talented Mary Fish!! Love the banner hanging off the edge!! 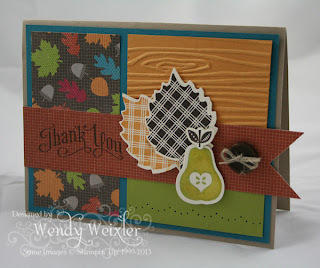 And although it doesn't show up in the photo very well, I used my newly-found-old favorite, Crystal Effects on the pears. Moving on to HALLOWEEN!! FAVE-FAVE-FAVE holiday!! 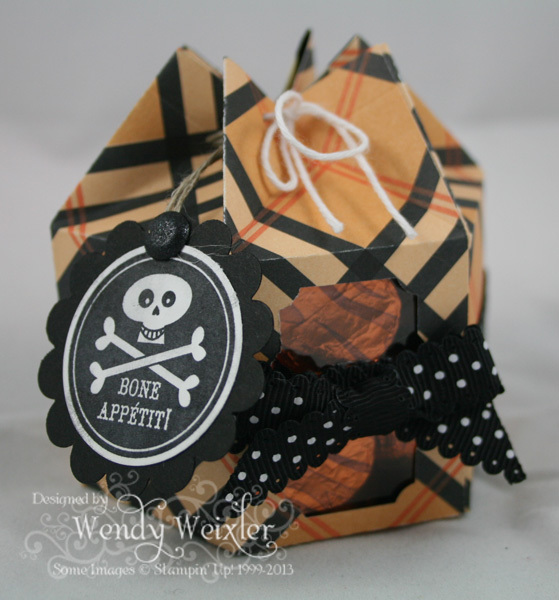 Here is a little Monster Munchie!! It is filled with the new pumpkin spice Kisses ... OHMYGOSH!!! Those are HEAVENLY!! Glad the photo has been taken, 'cause now I can EAT 'em!! Which brings me to this wreath ... in theory this was gonna be a lot less time-consuming (as are so many of the projects I start!). By the time I got done with it yesterday (the day I had PLANNED to post it!! ), there was no good light left outside so that I could take some decent photos, so I had to wait for the sun to come sufficiently UP this morning so I could share this with ya!! This wreath is mounted on one of those wire frame wreath forms that you can get at your favorite big-box-crafty-type store. (To be honest, I was happily surprised that it was just less than $3!). The bigger cones in the back "row" are made from 4" squares (with the bottom tips wrapped around the wire from back to front), and the smaller cones are 3" squares wrapped around the other wire from front to back. 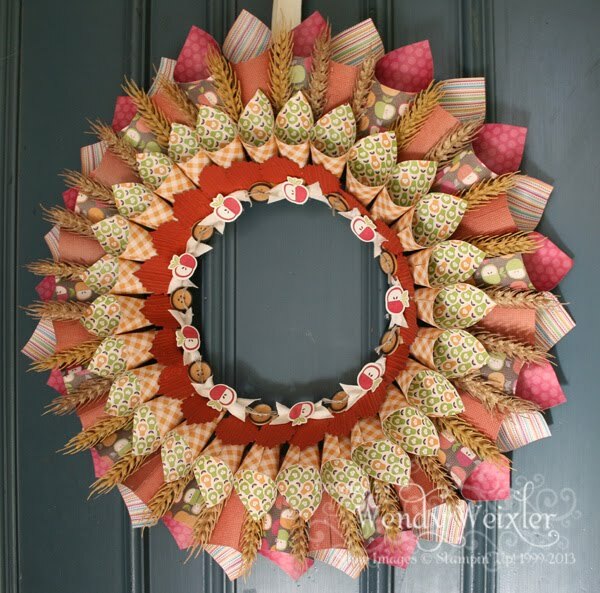 Actually, those wire frame wreath forms have FOUR "rings" ... you attach the cones to the two innermost rings. I attached the ribbon for hanging to the outermost ring and the apples and buttons are attached to the innermost ring. Make-a sense?? Tune in tomorrow to see what else I created this month with my box of goodies!! 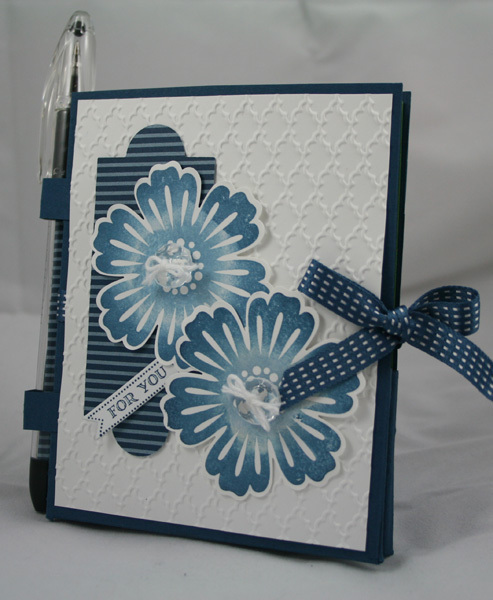 I am excited to finally be sharing this little card folder with all y'all! 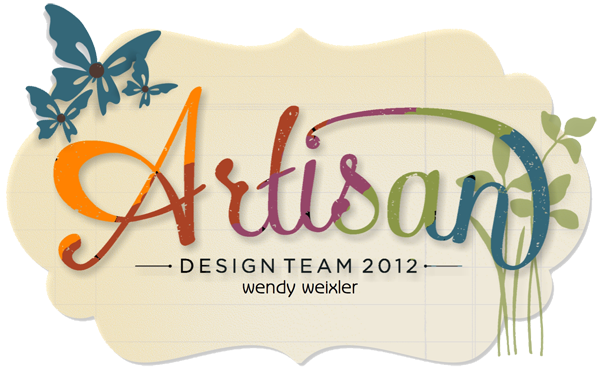 I made this as my first "Facebook" project as a member of Stampin' Up's Artisan Design Team. We are being asked to create one project a month (in addition to other projects!) that will be showcased on Stampin' Up's Facebook page, and this is what I came up with. 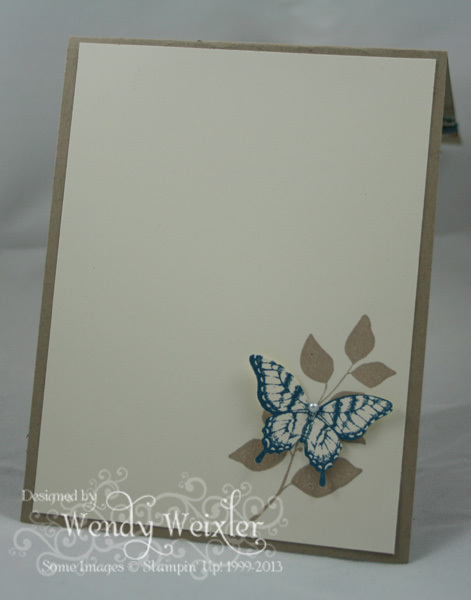 To make the pen holder, cut two pieces of cardstock to 3/4" x 2 1/4". 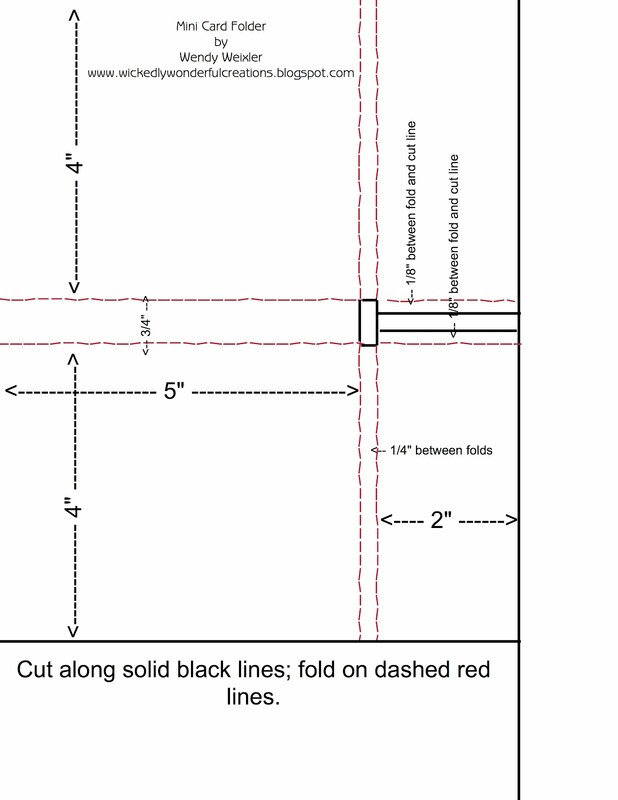 Score at 3/4" and 1 1/2" and fold along score lines. These will be adhered to the finished folder approximately 1" from the top and bottom edges ... make sense? When I am typing instructions I always feel like I am trying to get English out of Italian translated via Japanese!! 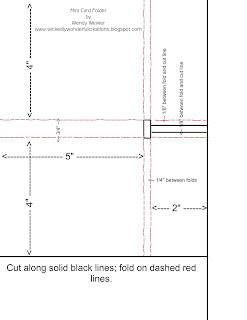 This is a little template I created that shows where you cut and fold ... the red dashed lines are fold lines, and the black solid lines are for cutting ... click on the picture to enlarge it. You will probably hafta zoom in a bit as well (use your control or command key AND the "+" key). I have had a lot of issues with trying to attach downloadable files to Blogger ... it doesn't seem to like to do it!! 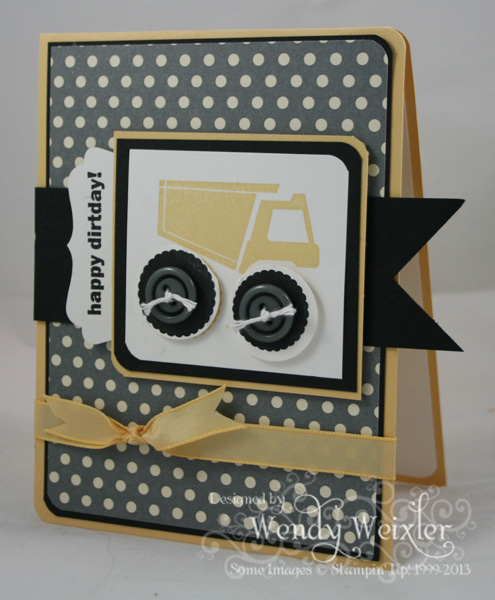 Actually, though, I was pretty happy with how this card turned out ... 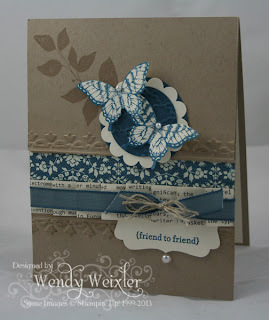 I seem to be having a total loveLOVElove thing with Crumb Cake cardstock as of late ... I have been burning through it like crazy!! It pretty much seems to go with EVERYthing!! Here is the inside of the card ... adding just a little to the inside of a card really just finishes it off. The extra touches just add so much. Can this be Wednesday already??? I can't believe this week has whizzed by so quickly already!! Guess that means that the weekend is only a few days away ... YAY! !